I have great news! Remember the interview I mentioned at the end of my becoming a SAHM post? It went well and I got a job offer! 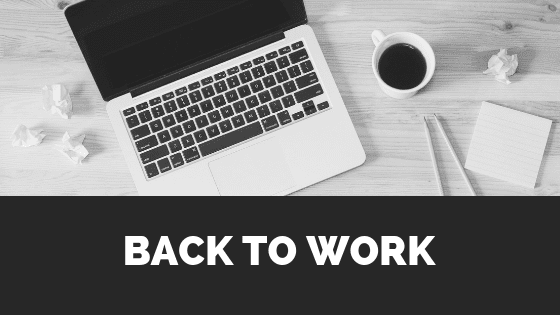 After more than three years as a stay at home mom I am now preparing to go back to work full time. I have so many mixed feelings right now. I worry about missing my kiddos. Out time together during the week will be much more limited, so I want to make the best of it. I feel like I want to get everything in order before starting my new job, but of course you can’t plan everything out in advance. I am really excited to be going back to work but I am so nervous about how we’ll manage our home life. Stay at home moms do so much work every day, that it’s hard to imagine how we’ll fit a whole day’s worth of work into only a couple hours at the end of the day. I have just a few weeks now to set our home to function well with two parents working outside the home. Both girls are doing well in school and daycare. Booboo will be two years old and will start going to daycare full time. She is always so excited to be there. Last week when I came to pick her up, she pointed to each of the kids and told me their names and told me “This my friend”. In a selfish way I also get a lot of joy from seeing her excitement and happiness when I come to pick her up. Lulu is loving her school and after school program already. She’s been going there full time from the start of kindergarten. A few of her friends from her class are also enrolled in the after school program so she gets extra play time with them. I love seeing how much she enjoys the free play time and all the arts and crafts and materials she gets to try out that we do not have at home. Like glitter glue. I’m always glad for her to work with glitter glue anywhere but at home. We considered the idea of a nanny and for now decided against it. It’s definitely still on the table depending on how drop offs and pick ups go. Even though daycare, work and school are all within a 15 minute radius of home, it still takes me almost a hour in the morning and another hour in the afternoon. Driving in rush hour can easily turn a 10 minute commute into half an hour. Spending two hours a day on the commute may be hard to fit into the day, though I do enjoy the conversations we have in the car. We’ll have to see how much the commute cuts into dinner time. Husband will have to pick up a lot more of the dinner time prep while I’m chauffeuring the kids home. Speaking of dinner, if we want to eat at a reasonable time, we pretty much have to get dinner on the table within 15-20 minutes of getting home. That’s not a lot of time to spend on dinner prep. That means that most of the meal planning and prep will have to happen at a different time. Luckily I’ve done this once before. When Lulu was 11 months old I went back to work after my first maternity leave and I think I got pretty good at getting dinner ready quickly. Preparing to go back to work means going back to freezer meals, slow cooker meals, pre-cooked food from Costco and some tried and true quick favourites. Check out all my tips and tricks for working mom’s meal planning and prepping. Part of preparing to go back to work means getting some of the ToDo items on my list done before work starts. Schedule overdue doctors appointments and check ups for everyone, myself included. I plan to find a house cleaning company to help keep our home from being a disaster. I wish I could have a maid and/or house organizer but alas that’s not a realistic wish. So I’ll have to be happy with a clean (but probably cluttered) home. I know we’re lucky to be able to afford that when we will both be working. We don’t want to spend our weekends cleaning the toilets if we can avoid it. Shopping, especially grocery shopping will have to be figured out. One of the big benefits of being a stay at home mom is the ability to go shopping at slow times. First thing in the morning, or the mid afternoon (around 3pm) are great times to go to the store. Fewer shoppers, close parking spot, no line ups at the cash registers. Going back to shopping on the weekends will definitely be a challenge. Luckily we do live in the age of online shopping. I already buy a lot our everyday necessities online and I know there are a lot of grocery delivery options as well, so may have to partake in them. We’ll have to learn how to be more efficient, do a lot more planning and make the most out of our time together on weekends. One of the most useful tools I’ve learned about in recent years (whether for SAHM or not) is bullet journaling. I recently went back to bullet journaling to keep all our appointments and plans straight. Have you tried bullet journaling? There is a lot of science in recent years that shows that going analog can help you remember better and organize your thoughts and ideas. You might have seen a newfound resurgence of paper planners and charts in the last few years. Bullet journaling is one such system that can be very flexible and customizable without the need for a special planner. There are a lot of really cool but intimidating videos out there for really elaborate bullet journals. But they don’t have to be complicated at all, they can be super simple. I started bullet journaling about a year ago and for a while it worked very well for me. Just the act of writing things down made me more organized. For whatever reason I haven’t kept up with it, but I will be making it a priority once again. All you need is a couple minutes. You can even use bullet journaling for your goal setting, weekly meal planning and even holiday gift shopping. I am lucky to work in an industry where flexible hours are the norm. I asked a lot of questions during the interview process about work-life balance and flexibility. As excited as I am to go back to the professional world, I am very aware that we do only have 24 hours in a day to get everything done and still be available to enjoy each other’s company. The last thing I want is to spend those couple of hours together being stressed out. As much as I am preparing to go back to work, I am keenly aware that one of the most important thing to prepare is my own mindset. Staying flexible, changing plans, being late. This will be an adventure for all of us, and it will be a difficult adjustment I’m sure. But having a mom who feels fulfilled with her work will set a great example to my daughters and will make me a happier mom at home. There you have it. Do you have any tips to share on making the work-life juggling act any easier? I’d love to read them, leave a comment below! Don’t forget to check out my Facebook page where I share a lot of tips, hacks, recipes and stories from fellow bloggers who are figuring it out. Congratulations! I worked when my first daughter was a baby and it definitely is a juggling act. It looks like your kids are in good hands and you have realistic expectations about planning and time management so you should be totally great! Enjoy your grown up time! thanks! I’m really looking forward to the grown up time.